We all feel pressure at one point or another, and with that pressure usually comes a lot of perspiration. When our sweat is combined with store bought antiperspirants, the end result is sure to be ugly yellow armpit stains! The task to get rid of these—or prevent them in the first place—may not be nearly as difficult as one would imagine. 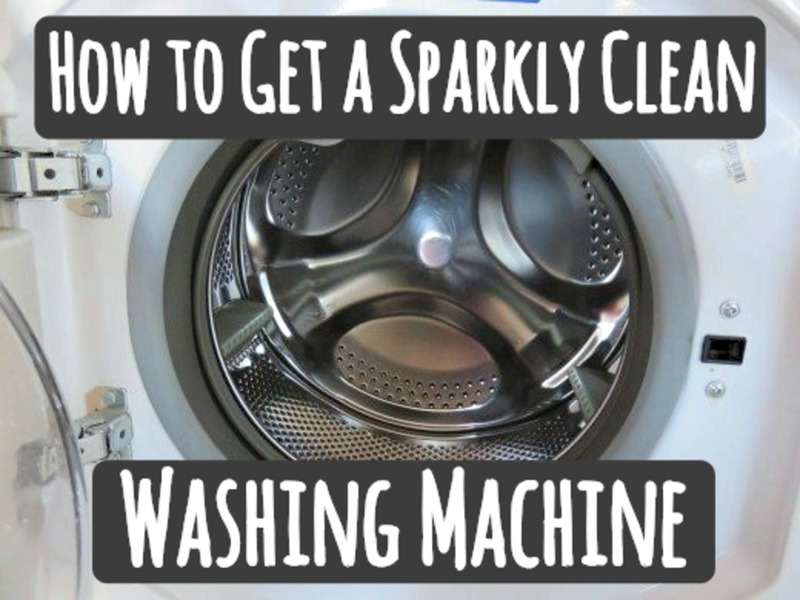 By following a few simple laundry applications and hygiene techniques, you may just find the stains caused by a stressful day at work, to be stress-free in the laundry room! Aluminum-based antiperspirants contain pretty high levels of acid, and also have compounds that add to the staining process. Human sweat contains traces of urea—same stuff found in urine—which also has compounds that contribute to the staining, or more accurately "dying" of fabrics. EXAMPLE: These compounds will dye white fabrics yellow, while dying dark fabrics a lighter color. 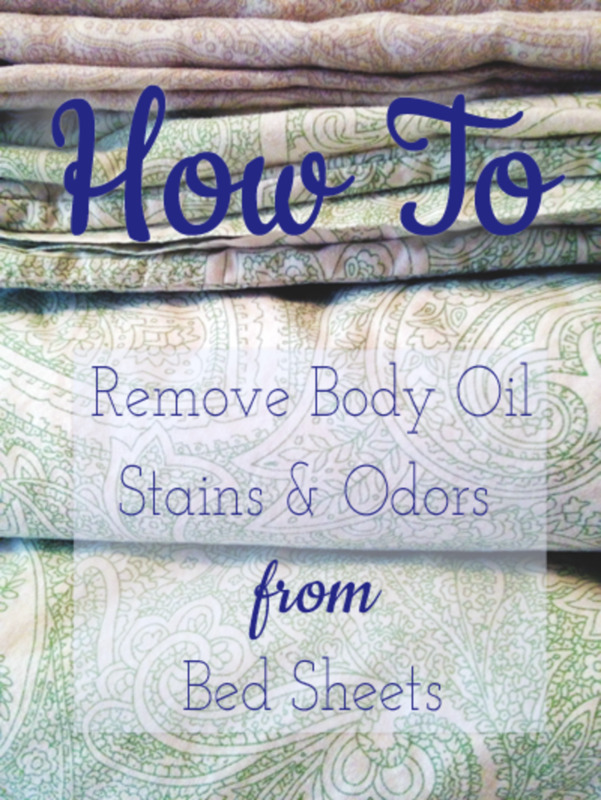 Everyone seems to have some crazy method or concoction to rid your fabrics of sweat stains. 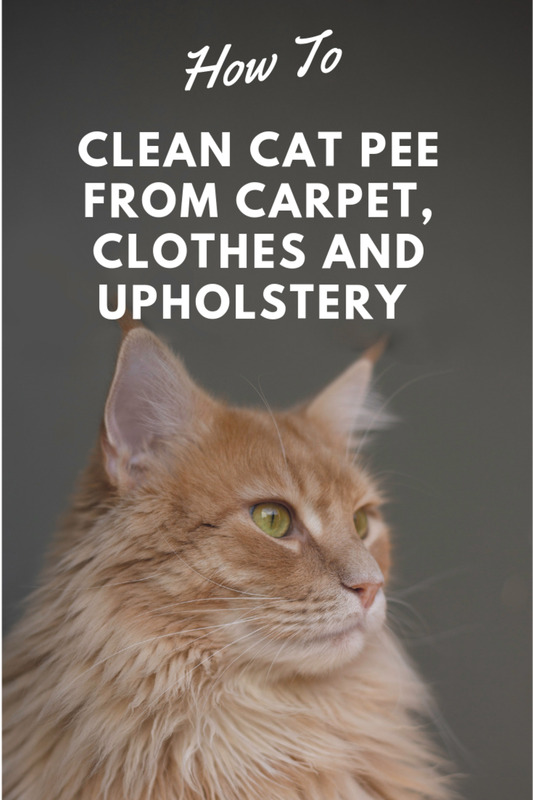 But, what if you discovered three really simple solutions for preventing those stains from setting in the first place? Check these out! 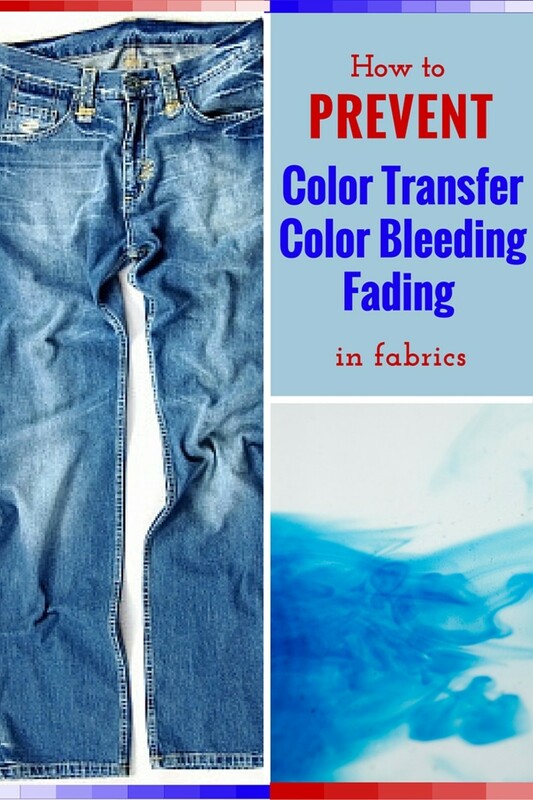 Wearing a barrier Between you and your garments can completely stop stains from occurring. These help to wick-away the moisture from your clothing, thus preventing stain buildup. By putting your antiperspirant on right after you shower or bathe, and right before you go to bed at night (allow it to totally dry before putting on any fabrics), you can reduce the overall amount of perspiration released from under your arms. This method places a barrier of protection between your glands and your couture! Use only a deodorant—these don't contain aluminum elements—instead of antiperspirant. This product will not stop the sweating at all, but also will not stain your fabrics. Some say that rubbing alcohol or vinegar on your pits then, allowing them to dry, you can reduce the scent of body odor. It seems these products kill the bacteria that cause body odor. The wetness will still reside, but talc powders and shaving the hair can be helpful for the wetness. A tiny bit on the extreme side, Botox injections are all the rage for reduced sweating. Almost all who have injections at the underarm site find amazingly good results. Repeat injections are required, but there is no arguing with the overall results. The 4 products (at right) that best help to remove stains from your clothing may be quite familiar to you. The manner in which you use them to remove yellow stains will determine the level of results you find in the end. Let's take a look at each method to find the one that suits your needs best. Vinegar - Make a vinegar and water solution of 2:1 (2 parts vinegar, 1 part water). Completely saturate the stained area with this mixture. Allow it to sit for two hours, then wash as usual. OxiClean® - Prepare a paste using the OxiClean® and water. Using an old toothbrush or scrubbing brush, work the paste into the stained area. Allow to rest for about 15 minutes, wash as usual. Aspirin - Make a powder using 2 or 3 high-dose aspirin tablets by crushing them in a sealed baggie. Place the powder into a medium size glass or plastic—not aluminum—bowl. Add a couple cups of warm water to the bowl and stir. Allow the aspirin to completely dissolve. Soak the areas of your clothing that have stains in the mixture, allow them to rest for two hours. Wash as usual. The main ingredient in aspirin is salicylic acid, which attacks the compounds found in sweat, breaking up the stain so it can be easily washed away. Be sure to get the sweat stain removal solutions on the inside of the clothing where fabric actually touches skin. After all, this is where the problem begins! Soak your sweat marked clothing in ice water immediately when you get home. This prevents the stains from setting all together. Never use bleach on yellow sweat stains. We all know that black can hide sweat stains remarkably well, but did you know that most other solid color fabrics can make those stains stand out? If hiding sweaty marks on your clothing is of vital importance, try adding colorful patterns and designs that have dark colors in the pattern to your wardrobe. These dark patterns and bright colored designs work to disguise the appearance of embarrassing stains by breaking them up. By layering light-weight fabrics, you can hide many instances of perspiration. Simply wear a solid colored cool and comfortable t-shirt or tank under a pattern designed open front top-shirt. The under shirt will help to keep the moisture off of your outer wear. This not only hides the sweat, but adds a little fashion flair to your outfit! 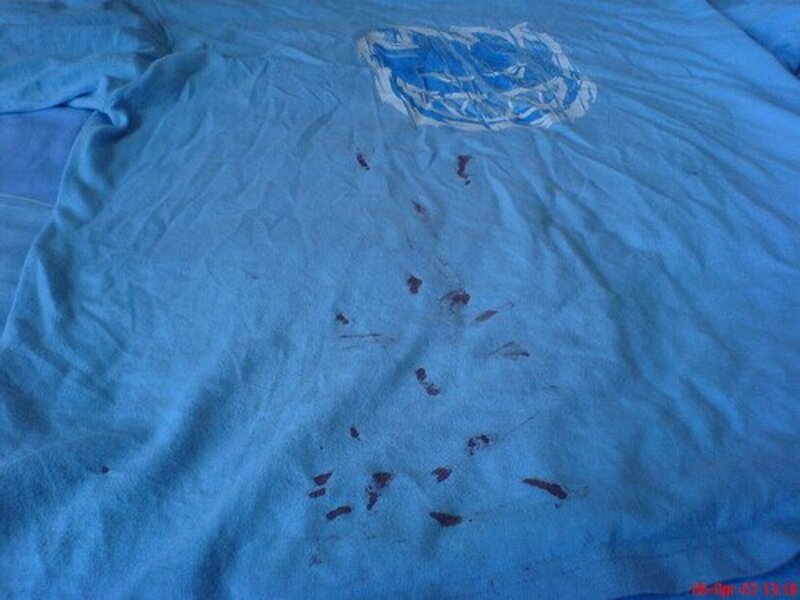 No matter what material you choose, remember that the pattern and design will still play a roll in hiding nasty sweat stains. If you are thinking cotton is a good material or fabric for the job, you would be mistaken. Cotton actually shows sweat marks far more so than most other fabrics. It does help keep you cooler, but at the expense of a sweaty fashion faux pas. The best way to hide sweat when wearing cotton fabrics is to stick with those that offer a blend; like 50% rayon or 60% polyester cotton blends. Velour and even fleece make fantastic sweat maskers, but they also may cause more perspiration to hide in the long run! 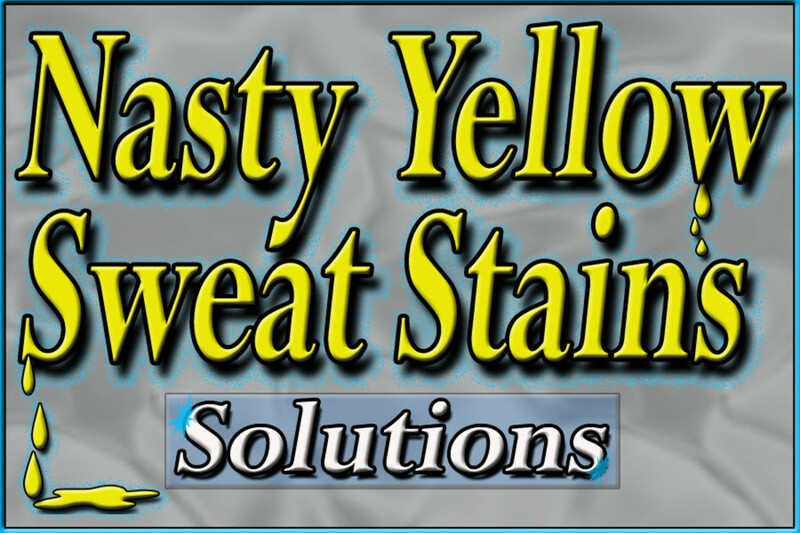 Do you know someone who has problems with yellow sweat stains? Adding these tips to your "armpit sweat stain" arsenal is sure to bring a confident stride to your day. Whether you choose to prevent, remove, or a little of both, those yellow sweat stains are on their way out of your fabrics' life. Keeping your day cool, your pits dry, and patterns on your clothes all help to reduce and remove ugly yellow sweat stains from your wardrobe. Which in turn, may keep fashion, romance, and success within your stain-free reach! Comments for "How To Remove Yellow Sweat Stains"
Who would have thought it would be so simple? Thanks for sharing your advice! Really great advice. The aspirin one is so easy. Thank you. Pinning this one for sure ! moonlake~ That s very interesting about Dial hygiene products. They may just have some aluminum chlorhydrate (sp?) in the ingredients somewhere. Like you, I also must have perfectly white whites! It is all but an obsession. They just make me smile. Thank you for sharing your thoughts on the subject. And thank you for the vote! Great hub. I also found that anything from Dial Soap will leave yellow stains. Their shower gel or hand soap anything that is made by them. My husband never has yellow stains but when he started using their bar soap he started getting yellow stains. When he changed to a different brand, no more stains. All very good ideas and I love a white wash and everything to come out clean looking. Voted uP! @Alecia Murphy~ Few people know that aspirin is a great helper when it comes to removing sweat stains, but it works pretty good when you follow the method here. I hope you find the tips help with saving a few clothing items! Thank you for stopping by and commenting! @stephhicks68~ Thank you, ma'am! Glad you find this interesting. It is always a treat to see you around! I didn't know aspirin would be good for removing sweat stains. I should've known vinegar would be good as well. I sweat constantly and have been trying to find ways to reduce this issue and so far I've done pretty well but I may have to try alcohol or vinegar now. Thanks so much for these tips. Wow - that is fascinating! Talk about sweating the small stuff. LOL! stephhicks68~ Wow, two teens, that can be a lot of nervous perspiration! You know the ultra-duty antiperspirants have to have double the aluminum elements. This is how these products reduce sweating: the compounds work to irritate the sweat pours so they tense enough to narrow the sweat's path out of the body, thus reducing the amount of sweating. Really NOT a great way to keep the body working in a healthy manner. Double the aluminum, double the nasty yellow stains! Thank you so much for stopping by to comment today, Steph! I am always honored when you do. Daisy Mariposa~ You are too kind, ma'am. Thank you so much for such high praise regarding the hub. I sure appreciate your continued loyalty and support. It means the world, Daisy! TToombs08~ Thanks, and you are welcome! I am grateful for the hublove! Sally's Trove~ I can really relate to losing a couple of T's each year. Summer activities and even gardening can really bring on the perspiration! I am so happy to hear that you find the hub interesting. I appreciate your support. mary615~ I love vinegar as a hard working home cleaning agent and so much more! I believe I became more attached to it following your article. Botox freaks me out a little, too. But, for those who are suffering from extreme perspiration, getting those injections can be a real benefit. Thank you for sharing your thought here, Mary! Ericdierker~ Some of my family come from the land of construction workers, whereby a yellow sweat stain is a rite of passage for the men, and a measure of skilled labor for the women. 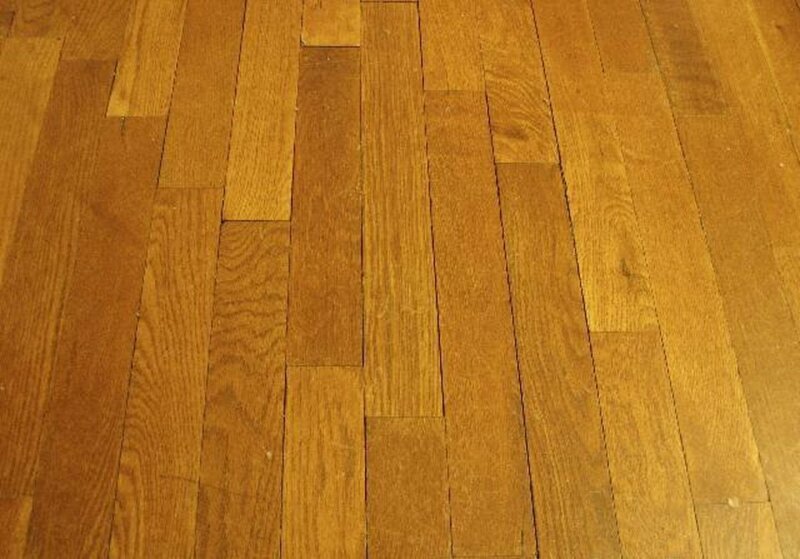 These stain removal tips are tried and true, to say the least! Thank you for your kind comments. Mike Robbers~ I agree, yellow perspiration stains are bothersome! Thank you for your remarks. Natashalh~ Everyone sweats and at some point or another, will find a yellow stain or two in the underarm area. 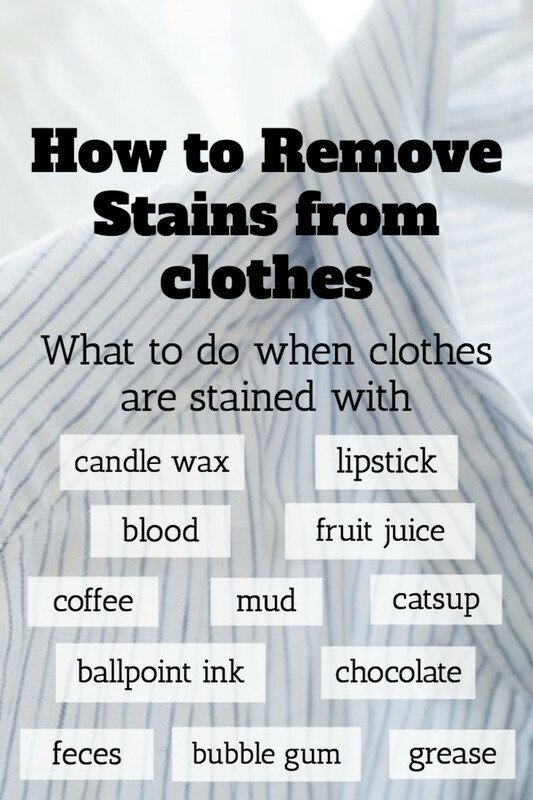 I am glad you will be trying some of the ideas for getting those stains out. Thank you for commenting. I work outside and sweat stains are a huge problem for me. Thanks for the list of things that can remove them! I am going to try some of these this evening. Quite Useful hub , those yellow perspirations are really annoying..
You are a very good writer. I liked this hub because it has a high value of "how things work". Where I come from the stains are a fact of life. Good tips here. I don't think I would like Botox injections, though. That would hurt too bad, wouldn't it?? I voted this Hub UP, etc. and will share. 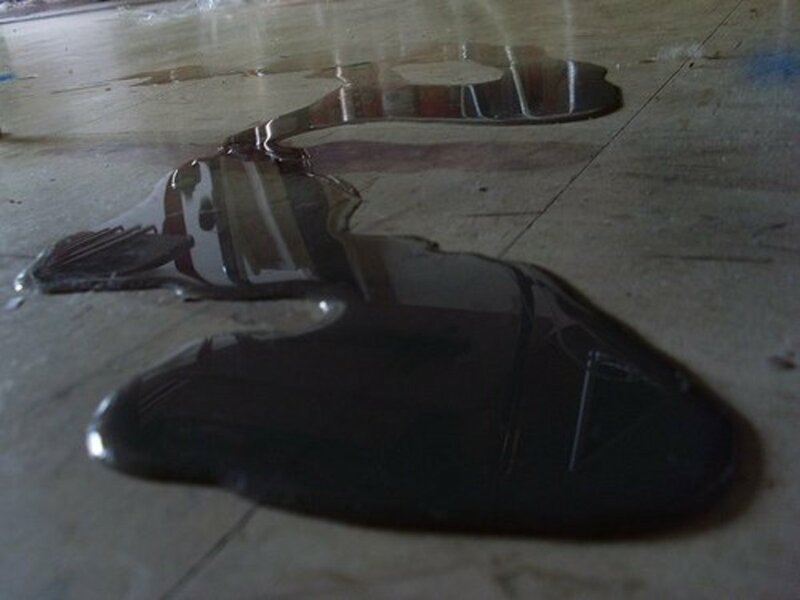 Really interesting article, especially about what causes the staining. I just hate that, every year, four or five weeks into summer I ruin a new white tank. I always have to buy two or three at a time so I have extras when one goes. Rather than turn this past summer's whites into rags (as I usually do), I'll give one of these treatments a try. Up, interesting, useful. Great tips, k9! Thank you! Voted up and shared. No matter what the subject is, you always do a thorough research job and produce a well-written, well-formatted informative Hub. It isn't any different with yellow sweat stains. Interesting hug just book marked it just in case... Thanks!